Just Romantic Suspense: Romantic Suspense—Anywhere and in Any Time! Romantic Suspense—Anywhere and in Any Time! Congratulations to the winners, "Janice H.", "Janet K." and "Amy S.", the winners in Cathryn's giveaway. Thank you to all who participated! Romance has been a staple for readers ever since story tellers have been telling their tales. And who doesn’t love a good romance laced with a healthy dose of peril and suspense? Because romantic suspense has been around ever since storytelling became the major source of entertainment for people all down through the ages, it can also use any time in history as its backdrop. I love reading books of romantic suspense set in other times. The action and danger keeps me riveted, the romance has me sighing, and the different time and place always takes me away. When I began writing my own books, it was natural for me to set my series in some other time, with strong and resourceful who were full of life. So I set my romantic suspense stories in the American West—where danger easily lurks around any corner, and there are thousands of different places to set the scene. The Circle ofFriends series takes place in the young and rowdy town of San Francisco, glittering with the newly discovered gold from the mines in the mountains to the east, and where thousands eagerly stepped off (and then the entire crew abandoned) the ships in search of their fortunes. With so much gold, so much opportunity and a town exploding up the hills rising above a sparkling bay, there’s no escaping the schemes and deadly plots of those who wanted a piece of it all, no matter who got in their way. I hope you’ll enjoy reading a new type of romantic suspense, and become lost in the stories of a close knit circle of women who dare to stand on their own in a time and place that called on every ounce of their courage, ingenuity and loyalty to each other, and the brave, hardened men who love and protect them. I’d love to hear from you, so please feel free to stop by my web page (and this is where you go to sign-up for my list! ), Facebook page, send me a tweet or catch me on goodreads! I’m giving away two e-book formats (.mobi files for kindle readers or a kindle app), and one $10 Amazon gift certificate. Just leave a comment and give your guess on how a killer can manage to move about in total silence, just the way the killer does that Lillian and Charles have to face. Thank you for reading my blog post—and Happy Reading! Although the series has recurring characters, every book can be read as a stand-alone novel, and Only One Dream is no exception. This is the third story in the series, and follows the romance of Lillian, the orphaned girl who grows up to own the very successful owner of The Gentleman’s Club, and Charles, a sophisticated gambler from Virginia. While the love between them grows, a pair of deadly killers strike close to Charles, with Lillian targeted as their next victim. 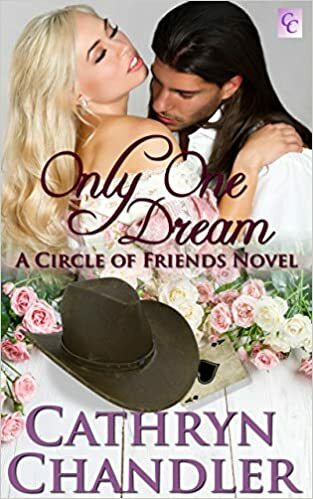 Come meet Lillian, Charles and all the unusual, bold and engaging people around them, who band together and form an unbreakable Circle of Friends. Giveaway ends 11:59pm EST July 23rd. Please supply your email in the post. You may use spaces or full text for security. (ex. jsmith at gmail dot com) If you do not wish to supply your email, or have trouble posting, please email maureen@justromanticsuspense.com with a subject title of JRS GIVEAWAY to be entered in the current giveaway. Okay...I'd go with magic as my first guess (a la cloak of invisibility) but if that's not an option I'd say good shoes and lots of experience. Experienced hunters and trackers can move silently through the bush, it just takes practice and skill (of which I have none...I'm sure I sound like a herd of elephants approaching). It's creepy though when someone can silently sneak up on you. I'd say he's used to tracking people and has learned how to use the environmental noises to cover his movements. I hate it when someone creeps up on me, I'm apt to punch them in the face. A killer could move about in total silence by being in "the zone"
I would say the killer was trained some how... I love romantic suspense novels... always great to see how things unfold! Thanks for sharing! By using the environment. By knowing the environment. If the killer was a human sans paranormal ability, I'd say they got training and used to moved about silently, like a predator. But a lot could be say if they have supernatural ability, say like moving between time or invisibilty and just took form when it's time to strike. If the killer doesn't have paranormal ability, I will assume that the killer can move in silence because of extensive training. Like soldiers or predators who know how to hunt their preys. They know how to move quietly and they can wait in patience. With the series set in the American west... he could be a Native American, or lived with them. They had the ability to move silently and blend in with the shadows. I'm intrigued by this book. As for the question, going barefoot is an option. I doubt that's it so I'll just have to read the book and find out.